Should we prevent Zika microcephaly using birth control? 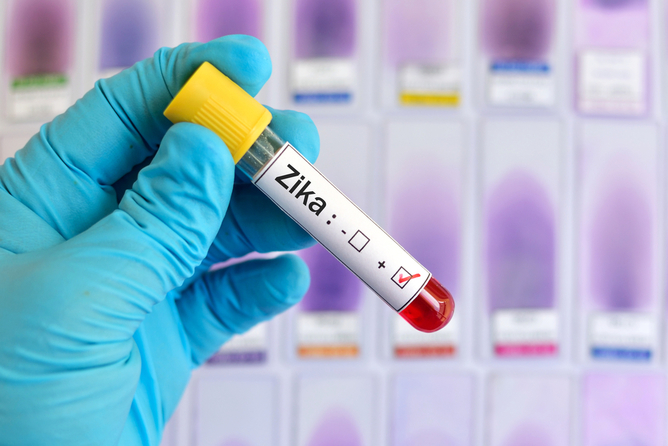 The World Health Organisation is to hold an emergency meeting after considerable concern about the zika virus in South America. The epidemic has been of considerable concern particularly because it has been linked to microcephaly (unusually small heads) in newborn babies that can lead to potentially devastating brain problems. There is fear that this virus (if it is the cause) could spread throughout the Americas, including North America. There is no vaccine or treatment for the virus, and no known treatment for children who suffer brain damage in the womb. Officials in Columbia, Ecuador, El Salavador and Jamaica have recommended that women avoid or defer becoming pregnant to prevent their babies being affected. But is it ethical to use birth control to control Zika microcephaly? In November, Brazil declared a state of emergency following a sudden and unprecedented surge in the number of newborns born with microcephaly. There are reports of almost 4,000 babies born in Brazil in recent months, compared with a normal rate of about 150 cases a year. Microcephaly can be caused by a range of different factors and illnesses including genetic abnormalities or after exposure to drugs or radiation. In some cases later intelligence may be normal. However, there is a relatively high rate of intellectual disability, epilepsy and other developmental problems in children born with microcephaly. This is because the small size of the head often indicates a very serious problem affecting brain development in the womb. There is some evidence that the surge in cases may be caused by the Zika virus. Zika is carried by mosquitoes and normally causes only mild illness in adults and it hasn’t previously been reported to cause brain damage to foetuses. It may take some time to confirm whether this theory is correct. We also do not yet know what problems these children will have, though many of the babies in this outbreak already have shown signs of brain damage, so it appears likely that a significant number of them will have serious degrees of disability later in life. Controlling mosquitoes is one way to stem the virus, but there are significant challenges to doing this. Alternatively, one way of preventing Zika microcephaly may be to defer pregnancy. It isn’t known for sure with Zika, but the highest risk time for brain damage to foetuses from other virus infections is during the first three months of a pregnancy. If Zika virus is the cause of this epidemic, it may be that becoming pregnant out of the rainy season (ideal breeding conditions for mosquitoes) would reduce or eliminate the risk of brain damage to the foetus. (Other viruses carried by the same mosquito (for example dengue) have a regular seasonal pattern of infection during the rainy season). Deferring pregnancy for a longer period would also have the advantage of potentially giving scientists time to work on treatment or vaccines for the virus. Using birth control to prevent illnesses in foetuses raises both philosophical and ethical questions. One question that is raised by the above proposal is how much of limited public health resources should be spent on contraception, compared with other interventions to address Zika microcephaly? For example, would it be better to spend money on providing access to birth control (and deferring pregnancy), or on providing measures to prevent or treat infection in women who are already pregnant? Imagine that we knew that with $1,000,000 we could fund one of two programs. In Birth Control, we could provide treatment to allow 100 women to delay pregnancy until after the rainy season, when they would have a baby without microcephaly. Or in Mosquito Control we could provide measures to reduce mosquito numbers that would result in 100 pregnant women not being infected with Zika virus and their fetus not becoming microcephalic. Is there any ethical difference between the programs? Three decades ago Oxford philosopher Derek Parfit in his book Reasons and Persons, provided an example that was very similar to the real world problem of Zika microcephaly, and noted one difference between these options. If women delay pregnancy until after the rainy season, the child they would conceive would be a different child from the one they would have conceived several months earlier. It would be a different combination of sperm and egg, therefore genetically different from that earlier child. But the children in Mosquito Control who don’t contract Zika are the same children who would have been microcephalic. This might make a difference. If we do not fund Mosquito Control, there will be 100 children who will be worse off. They have microcephaly, but could have had no virus infection, and no ensuing brain problems. They would be harmed by a decision not to fund the program. In contrast, if we decide not to fund Birth Control, and 100 children become microcephalic, those children will have no grounds for complaint. Although they have serious brain problems, they would not have been better off if the program had been funded – they would not have been born. Perhaps, indeed, they should be grateful to the policy makers who didn’t fund Birth Control? It is difficult to know how to respond to this philosophical question. If we think that the possibility of someone being ‘harmed’ makes a moral difference, then perhaps we should to fund mosquito control rather than birth control. Alternatively, if we think, like Derek Parfit, that there is no difference between these two options, perhaps we could choose either. In the real world, (beyond philosopher’s thought experiments), we do not know how effective different options would be. It will often make sense to attempt to address a problem in multiple different because some of them might not work. Perhaps we should choose Birth Control and Mosquito Control? Some reproductive rights advocates have argued that the advice to delay pregnancy is unrealistic and will be ineffective. As many as 50-60% of pregnancies in Latin America and the Caribbean are unplanned. There is a high rate of sexual violence. And people in rural areas often do not have access to birth control. Yet, the high rate of unplanned pregnancies doesn’t provide a good argument against birth control recommendations. If 40% of pregnancies in these regions are planned, advice to defer pregnancy could lead to a 40% reduction in the rate of zika microcephaly. In fact, the lack of access to birth control and the high rate of unplanned pregnancy means that paying attention to birth control may be especially important, and would provide other significant benefits to women’s health and well-being; it can reduce infant and maternal mortality, help prevent sexually transmitted infections, reduce population growth, and enhance women’s access to education. It would be of value, even if it does not address the cause of the epidemic. Another advantage of birth control (compared with measures focused on the virus) is that it may prevent cases of microcephaly even if there is something else that is causing the epidemic. An alternative way of addressing the problem of microcephaly would be to increase the availability of pre-natal testing and offer the option of abortion if the foetus is found to have severe microcephaly. This approach would be a more targeted approach to Zika-microcephaly than birth control. It would impact a smaller number of women. However, currently there is very limited access to abortion in most of the countries affected by Zika virus, and low rates of ultrasound during pregnancy. While this provides a separate reason to advocate for reproductive rights and improved antenatal screening, it is highly unlikely that there will be major changes to this in the short term. In contrast, contraception (though not necessarily emergency contraception) is already legal across central and South America. Birth control will not solve the problem of Zika microcephaly. But it has the potential to prevent a significant number of cases, even if our current theories turn out to be wrong. It is safe, accessible and well-tested, more than can be said for vaccines or anti-viral drugs. Investment in birth control, would also have a number of important benefits for women’s health and well-being. If and when, international funds become available in response to the zika epidemic, there should be a significant investment in birth control in Latin America. Governments in these regions should take seriously the need to address and remove barriers to contraception. 4 Responses to Should we prevent Zika microcephaly using birth control? But the children in Mosquito Control who don’t contract Zika are the same children who would have been microcephalic. That’s actually not true. By entering an intervention like Mosquito Control into the system, you create butterfly effects strong enough to change the identity and genetic sequence of all children conceived on earth after that point. In fact, smaller changes like writing a blog post will do the trick, by changing everyone’s micropositions indirectly, in a compounding way. In addition, you randomize most of earth’s traffic accidents that happen from then on. That’s tens of thousands of deaths every day reshuffled. These randomizing effects are strong enough that this sort of identity argument can’t make an ethical difference when choosing charities or policies. This is badly formulated, and the blog post is not very clear on this point either. I think the point is this: in order to speak of the ‘same child’ in two possible worlds, then the worlds must themselves be identical. So, for example, a question of the type “What if I had been born in 1500?” is unanswerable, since parental diet alone is enough to make any child born in 1500 physically different from a child born in the 20th century. You could not have been born in 1500: it would have been someone else. The requirement to compare like with like, i.e. to compare identical worlds, makes it very difficult to compare the position of the child-who-was-not born with the child who is in fact born in the real world, or vice versa. But I suspect this is a diversion anyway, and that what we are really talking about is the position of the Catholic Church on abortion and birth control, which is a political and cultural factor of great significance in Latin America. The comment by Rita Joseph (below) illustrates this attitude. The position of the Church is that the life of even the most damaged foetus is sacred, and that applies from conception, even before there is a foetus in strict medical terms. Agree or not, this position is clear enough, and does not require any reasoning about those-who-might-have-been-born or those-who-might-not-have-been-born. It should be noted that it is not just advice on postponing pregnancy that is being undertaken by some governments but also there is in many current media accounts an impassioned pushing of abortion on pregnant women with the Zika virusl. The World Health Organization has stressed today that it has not yet been established that the Zika virus causes birth defects. It can be congenital – meaning present at birth – or it can occur later during infancy. It is relatively rare, affecting about 25,000 children in the U.S. each year. It can be an isolated condition, or it can be associated with another medical problem. It often (but not always) causes learning disabilities and other neurological issues. Unfortunately, microcephaly is a lifelong condition that cannot be cured. However, there is hope: Advances in neurological care have made possible new ways of managing a child’s symptoms, allowing a child to achieve and enjoy an optimal quality of life. What are the treatment options for microcephaly? Microcephaly is a lifelong condition for which there is no cure. Some children with the disorder don’t experience any difficulties beyond a smaller-than-normal head size (and possibly a smaller-than-average height): They don’t need any treatment beyond routine check-ups and ongoing head measurements. However, the effects of the disease vary a great deal from child to child: Some cases of microcephaly lead to serious learning and speech disabilities, difficulties with neurological functions and physical complications, like seizures and facial deformities. For these children, treatment is geared toward managing the complications of microcephaly rather than the condition itself. It’s best to get the facts clear before embarking on philosophical and moral arguments.